He's a beautiful little 10 month old boy, of a single mom. His dad was abusive (to mom) but they left him. What type of spell work would you use to be sure he's surrounded by good protective energy? You could use the lucky mojo blessing spell kit. I have used it in the past for a friend of mine and it created a beautiful energy around that person. You can find all the lucky mojo blessing products on this page http://www.luckymojo.com/products-blessing.html , including the blessing spell kit that has everything you need including step by step directions. You can read about the use of blessing supplies here http://www.luckymojo.com/blessing.html . Hope you find these helpful and what a lucky little child to have someone who wants to do this for them! Hello my dear Hoodooers: Really I don't know how to start this dialogue, the truth is...I very much like to do some kind of prosperity and protection work on my children. I have tons of LM oils, powders, herbs, even a doll baby. I buy so many things but keep forgetting to use them, and now I want to do something specially for my daughter, she's having trouble, too stressed because of her job, financially drained her money don't lasts, and is a single parent, (the 2 boys father is a sorry excuse for a man, doesn't help her at all, he don't even work) she gets sick a lot, etc. the problem is she is frighten of this religion because she tells me that by me practicing it I'll never know what evil I could bring in my house and she doesn't want anything to do with it. How can I help her without her knowing it, I was thinking using the doll baby I bought from LM over a year ago, but I'm not an expert on it, what to do with it after the spell is done, how to dispose of it without harming my daughter since I'll be using her hair and nails, (I managed to get some without her knowing it). Also I want to do something for my son to be prosperous and get more construction contracts, they just have a baby girl and he's the only one working right now, also he is self employed; and as my daughter he is completely against this religion too. I've tried to explain to them how good this is and how much it has help me. I even showed them Ms. Cat's "Hoodoo Herb and Root Magic book" which I own and explained them how the use of herbs are applied for different situations, that this is not evil, on the contrary, this religion is to help people through the natural resources the good God has given us (Natural Herbs, roots, etc.) But they don't hear of it. I know you all are compassionate people who could perhaps help me out here, if possible? I'll be indebted to you for any advice. In advance I truly thank you. Last edited by MissMichaele on Thu Jun 12, 2014 11:09 am, edited 1 time in total. First of all, hoodoo is not a religion; it doesn't have worship traditions or churches of its own. It's practiced almost entirely by Christians -- though there are also non-Christians who practice. If you wish to reassure your children about the good that hoodoo can do, you might get a copy of Hoodoo Bible Magic: Sacred Secrets of Scriptural Sorcery. If the word "Hoodoo" frightens them, don't hand them the book -- quote from it instead. Don't worry about getting your children to use the herbs and learn spell work. You do that part yourself, where you can be private. Suggest Psalms for them to pray. Bring them candles to light -- and they can even be ordinary-looking free-standing candles which you have prayed over and discreetly dressed with fragrant protective and prosperity-bringing oils. Offer to wash their floors and bring your own Very Special Cleaning Supplies. Since your daughter's problems affect so much of her life, you may be working with that doll baby for months or years. It may be a long time before you even need to consider disposing of it. Even after her luck has turned around, you may wish to keep working with the doll baby -- less intensely or less often, perhaps -- to keep her life humming along happily. You can do money-drawing lodestone work for your son's family, too, and keep it in a nice box so you can close it when nervous people are around. Thank you so much Miss Michaele for your input, I'll check on all the posts and take it from there. As far as keeping the doll baby for my daughter a long time, I don't know how much longer I'll last here. I want to do the spell and as soon as I see some improvement on her, I'll have to dispose of it, in that way when I'm gone they (my children) won't find it and throw it away without knowing how is to be disposed of. I am very concerned about my two-year old daughter. She is very sensitive and I believe she is seeing spirits, which is really frightening her. I don't believe they are bad spirits, I can usually sense bad energies around me. This morning, for example, we were laying in bed before sunrise and the room was dark. I saw her sit up, look at the wall, and immediately lay back down, pulling the covers all the way up above her head, as if trying to not see. She did not say a word. On another occasion, she was playing dress-up in my walk-in closet (with the light on and the door closed), then she suddenly ran out of there like the famous saying: "as if she had just seen a ghost". What breaks my heart is that her father and I are divorced and share custody. Her father makes her sleep alone, I can't even imagine the terror she goes through. I anoint her nightly with my Lucky Mojo Rootworker's Special blend of Protection, Tranquility, Healing and Blessing. I also light a white protection candle when she is away. I am planning on beefing up cleansing and protection work in my home. Is there any other component I may be missing? I am mostly concerned for her when she is away, since she doesn't have anyone to comfort her when she is afraid. Thank you in advance and I appreciate your advice! It could very well be that she is seeing spirits. I can't discredit this because, at this age, they are still close to the world. However, as a Nurse, I am also advising you that at these ages, there are also visual tricks. Because their eyes are not fully developed, they cannot focus well. The result of that will be seeing shadows moving around. And forms of the shadows are also distorted. When they are not in the room alone, the figures stop nd become normal. This is because they are now focused on what has grabbed their attention (mainly you). So, I don't believe that the Medical Profession has a cure for this. Then, do the usual protection routines. Also, tell the spirit that it is scaring her. Usually when you do that, if they are benevolent, they will go away. Also, they don't like it when adults are aware of their presence. Usually, just the acknowledgment will make them go away. Thank you Miss Aida, you are always so helpful and wise!!! Hello everyone I hope I have posted this in the right forum thread. My question is do I need to change any if the herbs since he is not their mother but their father ? And if course I am not their mother? The spell calls for angelica root powder, motherwort and Althaea leaf. These are all protection herbs so it may need not be changed. I was just concerned whether it is strictly a spell a mother performs for her own family. Ethereal, that spell is on page 40 (Page 44 is the end of the Green Devil Money-Back Spell -- just in case anyone wants to read along ). Herb-magic.com recommends motherwort "for the magical protection of women and children; to bring peace to the home and family." You could use almost any other protective herb, but I wouldn't use anything sharp or hot, like blackberry thorns or red pepper. You might consider marjoram, "to drive off those who would harm your family; to protect home or business from jinxes." My newborn is only one month old. She sometimes suddenly cries out in her sleep as if she's having a nightmare and wakes up. Once in a while she also cries and shrieks in the middle of the night for hours. I know it's because she's having a stomach ache, but I can also feel that something/someone is bothering or teasing her..Like yesterday, I felt goosebumps and so did my mother when my daughter cried. I can see in her wandering eyes that something's wrong. So please help, what can I do to stop or prevent spirits from teasing and bothering my daughter? Cleanse the whole place of abode with chinese wash as you do pray the protection psalms and light a white candle in each room. Place a square of camphor in each corner of the baby's room. I am not sure if you can bathe your baby in herbal bath but you can ask during your reading. Also consider a protective amulet like St Michael for the baby. I am sure the worker will pinpoint the issue and give you suggestions. That is VERY interesting -- has "Hoodoo Candle Magic" sold out its first printing already? But now we're wandering off topic. Yes, I too would be a little apprehensive about the bath. I'd ask a Physician first. Hey, Ethereal48, your copy might be a collector's item some day! I am interested in working some general peaceful home / family+ home protection, but especially geared toward my 2 year old and 3 month old. What are some things you could suggest? I see the peaceful home kit, I'm looking at doing maybe a jar spell. I'm especially interested to know who or what forces I can call on to lend some protection to my little ones. Normally I hear of saints, but any others? Thanks for any insights! Praying to your children's guardian angels is a beautiful way to protect little ones. Thank you so much for the suggestions, I will try doing this! I am in desperate need of assistance! My family member just had a very dangerous and abusive man move in with her. She has a German sheppard that sometimes doesn't listen to basic cammands. The man will grab the German sheppard by its nose lift it off the ground and punch it in its head several times. He'll force the dog to dog fight with other dogs. I've seen him hit the dog with a bat several times. The neighbours all start to cry when they see what he does and everyone in the area is scared for our dogs. Is there any type of protection spell I can do for this dog? I need the dog to either be taken out of the house or escape or for that disgusting human being to never come back to that address. Please reply with urgency! He just beat the dog again. Beginner01: Can you call Animal Control or a rescue organization? They can take the dog away. What he is doing is a CRIME, and what's more, people who hurt animals hurt people: it's a well known fact. Also, maybe you should PM Miss Aida. She loves animals. She'll know what to do, I bet. Thank you for your response. This man is a criminal. The reason I am scared to call is because he also abuses the woman and her children. He might think one of them called and the abuse may escalate for all of them. Even worse he wants to get another dog if his own. The dog pissed himself in fear literally. I was asking if maybe there might be away to do a seperatuon safely or have him sent back to jail. But in the meantime I need some ritual I can do where the dog is concerned to ensure his safety. Try thehotline.org. They're the domestic abuse hotline, and they know all about how violence can escalate after being reported. Thank you for your sound advice. Thank you, Miss Aida. I'm not a rootworker, but like many women, I have been there, and I don't like seeing animals harmed. I just answered your post in another thread so hopefully that will help you. A protection spell for this entire family is a good idea, and hot footing this evil man is the right way to deal with him. Please read my response to you. I hope it helps, and the best of luck to you! You have blended animal abuse with child abuse in the same thread. Now, we are focusing on animal abuse on the wrong thread but I can't move it because it will cause inconsistencies. If you have any other animal abuse questions, please go to the appropriate thread and ask. Also, please limit your questions to once. I am seeing the same thing in different areas and including private messages to me. I don't mind trying to help people who are in need of preventing animal abuse (and it one of the very few questions that I allow via PM), but when you are asking me the same ting and then asking on the forum, that is when it borders on a board warning. So, please be careful about double posting and sending PMs that are also being asked on the forum. Recent events in my life have resulted in me needing some strong protection for my kids (and for myself). Can I use the Fiery Wall kit even if I do not have 1 specific "evil person" in mind? Is there a working that would be better for keeping us all, them especially, safe from multiple people and the situation itself? I love your screen name! My nickname for one of my beloved German Shepherds is "Cheeky Choo-cho" (Cheeky for short!). Try seeing which ones you fell call you. Hello I A grandmother of One! I have had my grandson the first couple months of his life! His mother snatched him away! How can I get him back or see him soon!! Welcome to the Lucky Mojo forum. Could you tell us a bit more about your situation? Are you fighting with the child's mother? If you give us a bit more detail we'll be able to help you better. Well Now I am fighting with her! Not physical ! She had one child already before my grandson came along! The kids are 9 months apart! I helped raise both of the kids! She got upset with me because the new father is my Someone my son knew! So she took my one and only Grandson out of hate and gave him away too Only God knows! And it's not fair! Yes a whole mess! A big Nightmare!! And it so sad Because my son father plays a big part in this situation! I'm expected to be an Uncle, and I'm praying for a successful pregnancy for my brother's wife. All health issues seem to be OK.
What I'm wondering is if there are any rituals that once the baby is born will help protect them, guide them, and bring them into the full awareness of God so that their youth is made as pleasurable as possible. I remember being anointed as a young child in a Baptist church I attended by the wife of the Pastor, who herself was also a Bishop. I was perhaps two or three years old. My life so far has been filled with synchronicities that I can only attribute to that blessing, or a blessing that was placed over me when I was born. My question is if newborns come with all the protection they need, or if there's something I can do to bless the child through rootwork after birth. 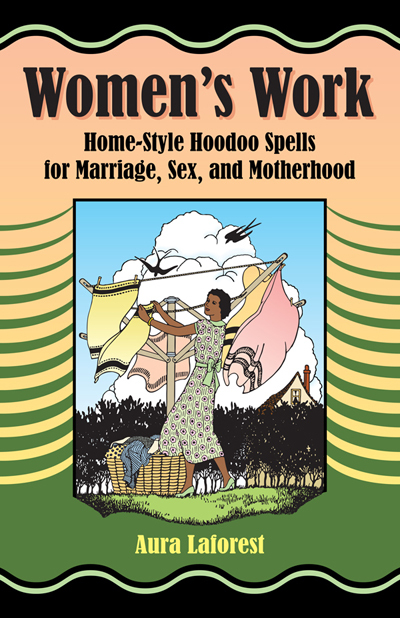 I sense there are some things in hoodoo in addition to christenings and dedications like prayers, baths, and rituals that I can do at home or in the hospital with the child, that can keep the newborn child away from harm and danger in both the spiritual world and the mundane world. Perhaps a wash off in chamomile tea and a prayer of and photo in Psalms121? "May this child be blessed away from harm and danger, and may her footsteps, wherever they land, come round to the face and Word of God that she might know Him for herself. May angels keep watch over her in mind body and spirit so that no evil shall befall her; and Lord let it be that she grows into a spiritual-mindedness that pleases you through the works of her soul and thoughts. As I anoint this child, so too shall her feet be guarded by the Blood so that wherever she steps she draws in the favor and strength of God and the expulsion by Angels of all harm set out against her, in youth and in age." I moved your post over to this thread because it's more on topic with what you're asking. If you scroll up through the other posts here, you'll find lots of ideas for spellwork for babies. Pure Olive Oil is the best anointing oil for babies, as it is not fragranced. It is common to use the oil to dress the head, where the open sutures of the fontanelle can be found, very lightly, while praying for the baby to fully inhabit his or her body and be blessed. Your prayer with Psalms 121 is beautiful. You show great understanding in that prayer. In some cultures, the child is not shown to people outside the family until the 40th day after birth -- for as Noah floated on the water for 40 days and the Hebrew Children wandered for 40 years, it is thought that the child is not "grounded" in life until the 40th day. Also, in these same cultures, it is common to present the child to visitors on the 40th day laying on a pillow and either wearing or having the pillow embroidered with red threads to symbolize the blood-bond to the family. Herbs good for newborns are Chamomile, Flax Seed, Motherwort, Angelica, and Althaea. They should not ingest these herbs, but the herbs can be placed in a mojo bag under the mattress or hung in the baby's room. You may find more baby and child blessing ideas in Aura LaForest's fine book "Women's Work." It is designed for women, but fond uncles may find material of use in it. Hi everyone, i have a toddler who is suddenly diagnosed with a very rare disease, that will need him to be on medicines for a long time. He sees bad dreams, and the other day he saw he was dying. i am very worried. we have some family members who hold a grudge against us because of inheritance arguments and other stupid things. one of the women is known to have "negative energy" -she was also fighting with her brother for her mum's inheritance and he got cancer, his son was disabled. Could it be a curse? Could it be evil eye? if so what do you suggest i do? i made a mirror box for this part of the family and threw it in a river. gave my child holly water in case of evil eye. i live abroad and currently have uncrossing oil, which i dressed a pink candle with, over a petition paper with my sons hair... would like to order fiery wall of protection but that will take sometime to be shipped over. just panicking...any ideas? I am so sorry to hear to that! You should get a reading, This could be a complex situation, as you put it, and a reading would help you clarify things. First of all, you should consider egg cleansings for your baby. Those are quite useful when it comes to the evil eye, to which children need extra protection from. This doesn't seem to be the case of evil eye, exactly, but egg cleansings do help lessening spiritually conflictuous situations. In order to do a cleansing in this manner you must take an egg, pray over it - you could pray 3 our fathers and the 91st psalm, that is what I would do - and pass it slowly through your child's body going downwards, while you pray. You begin passing it - the whole, unbroken, raw egg, just to make it clear - in the child's head going downwards to it's arms and then it's legs and feet, going from heel to toe, while you pray that whatever is bothering your baby leaves it alone, and perhaps repeating the same prayers. You should do this movement three times, always starting at the top of your baby's head and going downwards. Afterwards you are going to take that egg outside your house, into the street, and throw it in a crossroads, directly into the pavement, so that it will break. Don't look back into the crossroads as you return, and go back home through a different path than the one that lead you to the crossroads. You may repeat that everytime your child has bad dreams or feels generally indisposed. You may also leave a prayed over egg on it's bed during the day, while your baby is awake, and dispose of it at the crossroads before he goes to sleep, if he has a tendency of having bad dreams or right after he had a bad dream. Furthermore, add a cup of strong rue tea to a bucket of what you use to clean floors with and clean your child's bedroom with that. II. At night, leave a glass of water to which you've added some prayed over salt under the child's bed along with a bible opened on the 91st psalm. In the following day, throw that water into the street outside your house and repeat the procedure when your child goes to sleep. Those will help with cleansing and protection until the products you have ordered arrive and if you have the opportunity for a competent reader to tell you exactly what to do with this situation - if there are curses placed upon you, just how to deal with that on a deeper level etc. Always do cleansings right before engaging in spiritually protective measures. You have also mentioned uncrossing oil. There are people who conduct body cleansings with it by rubbing more or less in the same manner as you do with the egg, but I think the egg cleansing would be more fitting for this case. When your fiery wall of protection oil arrives, annoint the four courners of your child's bed with it. Light a candle for your child's guardian angel, if it fits your beliefs, annointing it with the same oil - there is guardian angel oil, but since you've ordered fiery wall you can make do with that, for now. Light it over a paper with your child's name written nine times in it, Pray over the candle as you annoint it - it may be the same three our-fathers and the 91st psalm - and say "I am lighting this candle for my child's guardian angel. May you be with him, free him from harm and protect him. Amen". You may chose a vigil candle for this, that would be a good call. Doesn't has to be lit in the child's bedroom, of course. Ok, so this how I would do it. Other people might do it differently and the forum's moderation will no doubt have some more fullsome advice to offer. There's some more you could do, but try this first and let us know how it goes. I know it may seem like a lot do to, but it gets easier once you get a little used to it. I am certain that this will help with the situation at hand. God bless you, and your child. Good luck! I hope everything turns out allright. Oh, and please make sure that that the bad dreams aren't a side effect of the medication he's been having. If that is the case then spiritual work may provide some relief, but doesn't fully replace propper medical attention. Asturias, thank you so much for taking the time to write a detailed post with great suggestions. I am grateful. I have been reading about egg cleansing and will definitely do this, along with your other suggestions. Today I have met a trio of dead baby sparrows in my front door as I stepped outside, they had probably fallen down the nest - it is probably just a coincidence, but because of the current situation, i am wondering if there could be anything to it...oh and i am pregnant currently, which makes me even more worried...should get a reading as you say...and will also order house cleaning/blessing products. Sorry if i am sounding completely hysterical do you know how i can get a reading from someone affiliated with the lucky mojo community? In the left bar you'll see links to each of the reader's professional page. They may also carry out spiritual work on your behalf - which may be what the situation calls for - or just teach what you could do to help yourself, depending on what the situation is. Have a look at their profiles and choose the one that you would feel most comfortable with. Their contact information and fees are usually at the bottom of their personal pages. In the meanwhile, have a look into spiritual baths. Personally, I like laurel bay and rue brewed into a tea. Try to have a cycle of those, ok? 3, 7, 14 days. But please, try to book that reading and have a look into what is going on, exactly. Thank you for providing such a thorough answer, Asturias! Always my pleasure, Sister Jean! Sister Jean, I want to thank you for placing me in the right area! I've been able to briefly explore this thread and hope to continue to learn more about this. And miss cat, thank you so much! The book you recommended is definitely on my list! I posted something similar in another thread but believe I may be able to get the best advice on this thread. My partners ex whom he has 2 children with practices African black magic. It’s obsurd to think I have to hide my child from social media as well as my relationship in fear of this woman. (He wants to teach me protection prayers) I am asking for any advice so that I don’t have to live in fear for my children and my own safety please. Any and all suggestions are welcomed. As it stands I will have to do some sort of protection for the remainder of our lives. So not only do I need suggestions but also instructions on maintenance. Hi! If this has already answered, please let me know. I looked through but i may have missed it. Im trying to figure out how to keep my husbands gf away from our child. Shes had little to no contact with him but im hoping to do something that will make it absolutely no contact. Ive already started a break up between them (husband and gf) and working on a hot foot to get her out but i would like something that will keep her away from my child until they do break up. I was able to keep her away for a bit by just saying no but thats not an option now (he thinks my reasons arnt valid that what happened 'was a misunderstanding'). She already isnt fond of kids, maybe i could build on that? Make her just not want to be around my child? I would put her in a freezer spell. This will put her "on ice", and I have personally had great success with stopping people in their tracks with this method. You can specifically petition that she leave your child alone, but do not add your child's name to your petition. How would i phrase the petition w/out adding my child's name? I hope you are in wonderful spirits! I recommend a book by Catherine Yronwode called “Paper In My Shoe”, &it’s about writing petitions, http://www.luckymojo.com/paperinmyshoe.html. Read the book. It will explain a lot about petitions to you. You will know how to write the petition for your spell. Good luck! You could write your petition for her to "stay away from innocent children" or words to that effect. Just don't use your child's actual name. Thank you miss athena and miss nikki!! I had another question? Im going to order that book but for this petition, would saying 'stay away from my child' be too close to using his name?